The allure of the open sea and promise of untold riches has called many a young lad and ornery old man to the Seven Seas. Enlisting on or stealing ships that they pray nightly will carry them over the treacherous ocean. Sure, many think of these guys when it comes to the legends of famous pirates… but history is just too terrified to write the real accounts. Anyone paying attention to the fact that all the famous pirate ships are called she know that the real pirate kings are pirate queens! Now, it is time to help your girl write her name into the pages of history and riches. And, she’s not about to do it with the scummy looks of all the standard pirates! She’s got style and finesse, nothing like those crude and unrefined lowlifes who merely think they are going to be in charge! 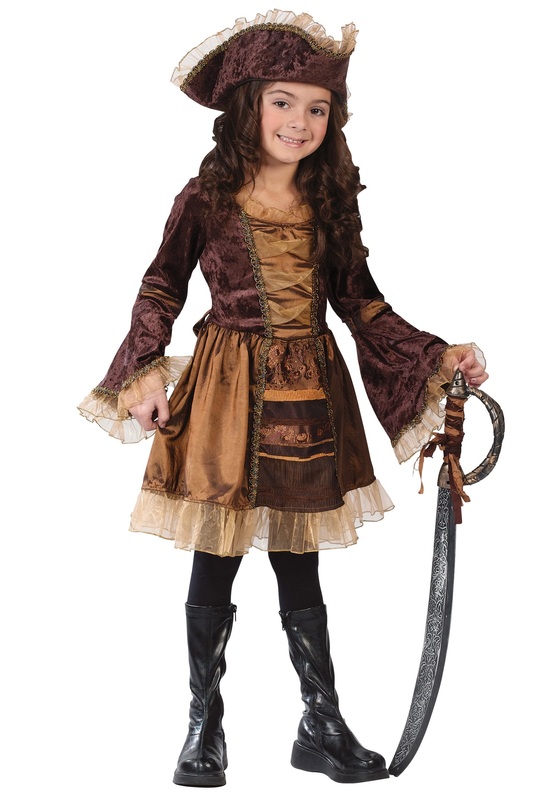 You can help her to take the first step with this Child Sassy Victorian Pirate costume. Show your scallywag crew just what kinds of gains they have in store by showing the gleaming gold that she’s acquired and a style that cannot be squashed! This flashy outfit is a perfect blend of high Victorian society and high seas and all is sure to keep those part time swashbucklers in the mainstay where they belong! This gold and brown pirate dress has lustrous gold and black embroidery throughout and shows off the wealth of the seas with gold ruffled trim. Lace floral designs throughout the long sleeves and wide old style cuffs reveal the regal look of proper society, all while the matching velvet pirate hat reveals the mischief and pirating potential in your little lass. Live out all our pirate fantasies all while staying prim and proper, a real Queen of the Seas! We had to return this because the lace edges of the skirt and sleeves and collar are seriously itchy. It's a shame, because it really is an adorable little outfit. I suppose if you put a layer of clothing on underneath it so it doesn't touch your skin it would work, but we didn't want to chance it.